We have an update from Merck on the Fosamax litigation concerning the femur fracture side effect -- not the osteonecrosis of jaw (ONJ) injury -- and it shows that the number of these lawsuits filed against the drug company continues to increase. ... plaintiffs in approximately 4,115 of these actions generally allege that they sustained femur fractures and/or other bone injuries (“Femur Fractures”) in association with the use of Fosamax. 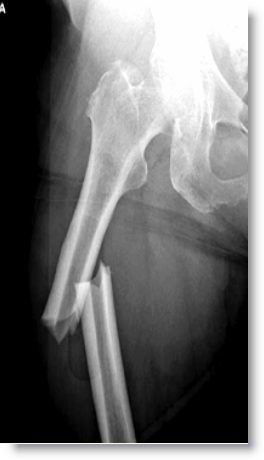 ... approximately 1,085 cases were pending in the Fosamax Femur Fracture MDL as of September 30, 2013. ... Judge Pisano set a May 5, 2014, trial date for the bellwether trial of a case where the alleged injury took place after January 31, 2011. The case to be tried on May 5, 2014, is expected to be identified in December 2013. A few years ago it was just a few cases; earlier this year it broke a thousand and now it is over 4,000 cases of spontaneous fracture of the femur! Scandalous when you bear in mind that the health professionals that continue to dish these awful drugs out are actually doctors! They should know better. They deserve to be sued. Note the link above to the free Fosamax case evaluation by Tom Lamb Law, if you feel you have been harmed by one of these drugs. 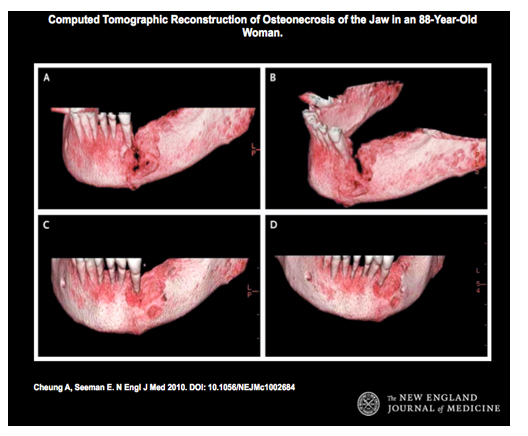 dreaded osteonecrosis of the jaw (refer photo to right). "Hey, Judith! Why are you promoting these harmful drugs? Is it just for the money? Will you demonstrate their safety by having an intravenous shot yourself? C'mon, Judith, don't be a scaredy-cat!"